A team of our Technical Engineering instructors joined students at Midhurst Rother College and engineers from the infrastructure group Balfour Beatty took on the challenge to help solve potholes on our roads. Part of an Engineering Education Scheme (EES) co-ordinated by our STEM Sussex team, the scheme is a six-month partnership and involved a two-day residential workshop here. 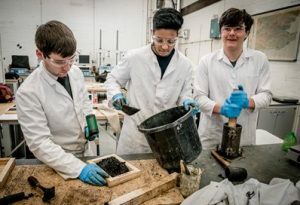 The scheme encourages Year 12 students to recognise the importance of science and engineering by providing an opportunity to gain useful skills and experience by working on a challenging project in partnership with industry. Midhurst Rother is one of ten schools and colleges which came to the university with engineers from different companies to work on projects including improving security systems, improving ways to monitor phosphates in waste water and creating models to display at science fairs including the Big Bang Fair South East. Midhurst Rother students are working with engineers to look for more efficient materials and ways of filling road holes. The project follows a report from Local Government Association which estimates the pothole repair bill could reach £14 billion by 2020. This entry was posted in Civil engineering, Events, Life at Brighton, News, Uncategorized.